Finally, FRIGGIN' FINALLY I got around to witnessing the first film from the minds of Joel and Ethan Coen and my goodness what a confident debut it was. Blood Simple is a masterful noir that plays like it was made by a filmmaker at the top of his craft, a crime thriller that both feels soothing in its calm pacing yet is also unnerving for the very same reason. I have long admired the Coens ability to make a brief film feel as if it was bursting at the seams with detail and meaningful dialogue. I had seen Fargo multiple times before I realized that it checked in at under 100 minutes and it seemed like a typo, an impossibility. So many incredible characters, so many memorable moments, so much brilliant dialogue and it all felt like it had plenty of time to breathe, a perfect almost poetic flow to the narrative that it balanced the rather thin line that exists between rushed and bloated. What now amazes me is that my eyes have been opened to the fact that they have had this artful, remarkable skill since the very beginning. Blood Simple is painted with a magical cinematic brush, one that somehow crafts a near masterpiece on its very first try yet you know even better things are yet to come. 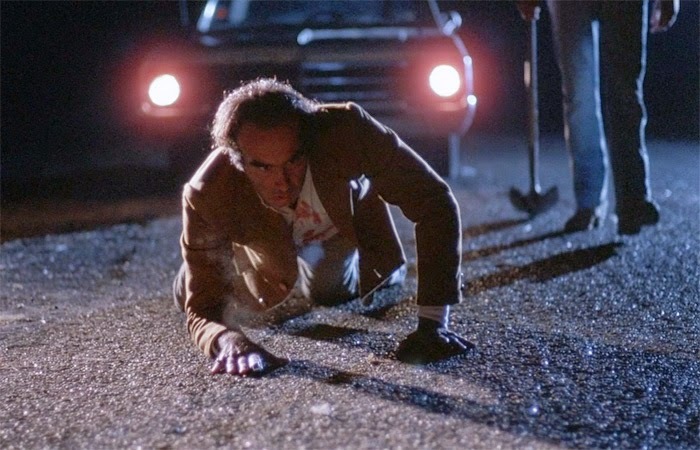 I can't imagine how excited I would have been had Blood Simple been the way I was introduced to the Coen brothers, not knowing was was yet to come from their brilliant minds. Films like Fargo, No Country for Old Men, The Big Lebowski, A Serious Man and Inside Llewyn Davis, all worthy of full marks in my eyes. I have always considered myself a massive fan of the Coen films, yet that claim had always felt a tad disingenuous because I still had a few gaping holes in their filmography that needed to be filled. Cross one off the list and color me so, so impressed.